When I am Copyeditor General ...: Nothing will dangle. Nothing at all. haha, I actually thought it was that literal meaning so couldn't see the problem, until you explained that that couldn't be what they meant. duh! they're saying as a courtesy, don't smoke. now I get it. Exaaactly. 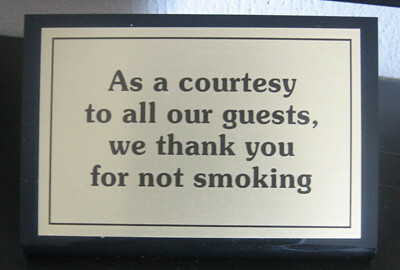 It just sounds as though they're saying, "We're being courteous by asking you not to smoke."